Exercise your DIY muscles and add a fresh face to your home's decor. Paint, handmade accessories, and hand-sewn accents will all do the trick. Plus, how fun is it to say, "I made that!" to family and friends? Give a ho-hum staircase a lift by dressing up the risers with decals. Try a design or pattern that extends the width of the risers, or go whimsical with number decals. Rescue glass jars bound for the recycling bin for this upcyled project. Clean out the jars and poke a hole in the top of the lid and screw a cabinet knob through the hole. 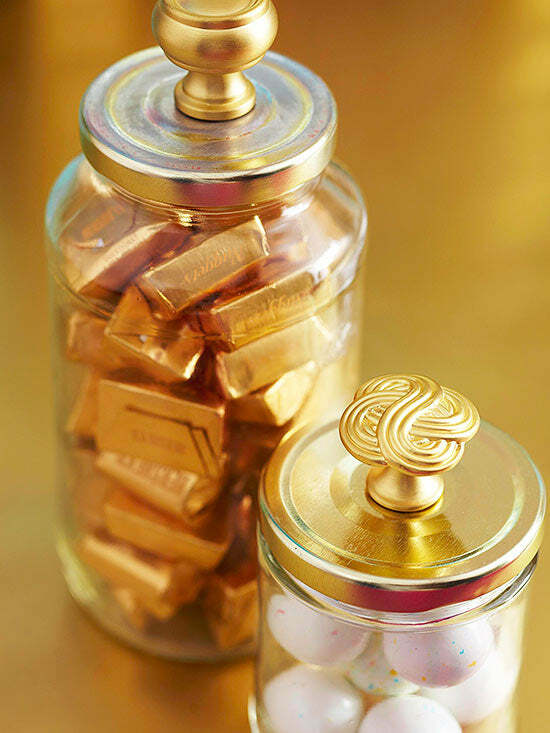 We paired gold knobs with gold lids, but you can also pain the lids to match your hardware. 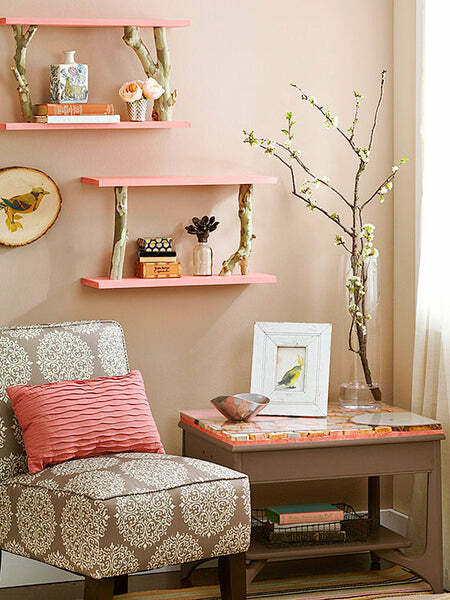 Create shelves with panache using birch logs as supports. Trim sturdy branches to equal lengths, keeping the cuts straight. Paint two 24-inch-long 1x6 boards in the desired color. Attach one board to the bottom of the branches using wood screws, and attach the second board to the top of the branches with wood screws. 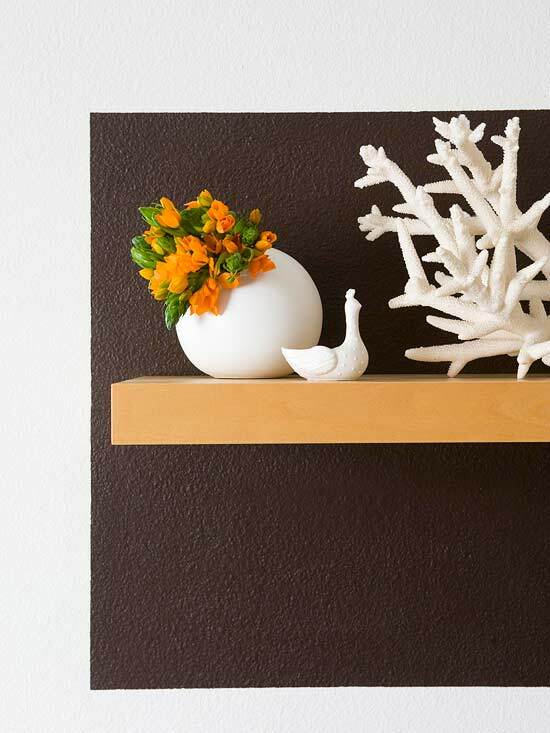 Hang the shelves using picture-hanging hooks driven into wall studs. 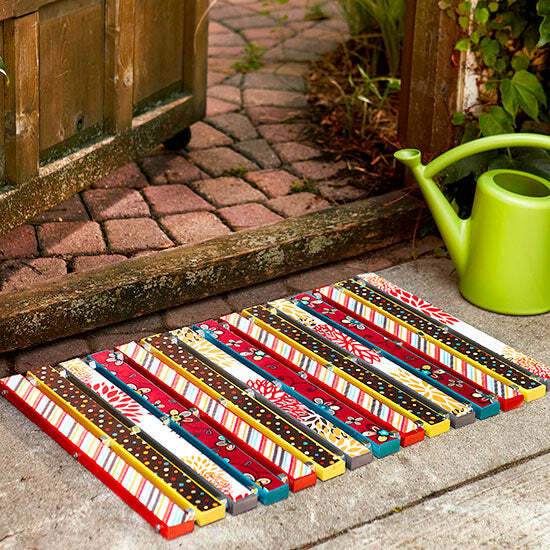 Make a colorful statement at your front door with a DIY doormat. Cut 1x2 medium-density fiberboard (MDF) into fifteen 24-inch-long pieces. Spray-paint the pieces with exterior spray paint, let dry. 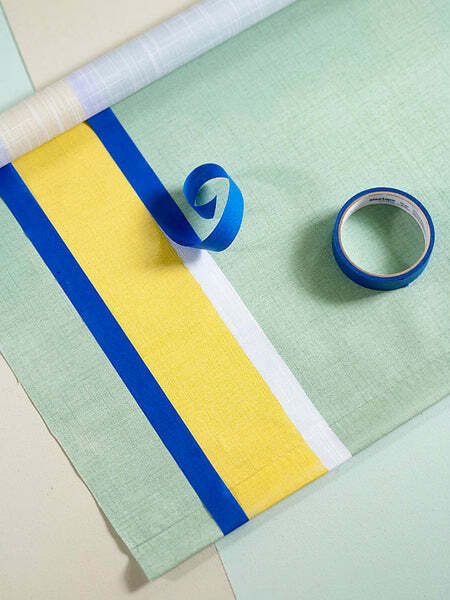 Cut coordinating fabric strips to size and affix to the slats with spray adhesive. Once dry, apply three coats of clear exterior varnish. To assemble, drill holes through each plank 1 inch from each end and at the center. Thread a small nut onto one end of each of three threaded rods; insert the rods through the holes in one MDF plank. Slide a larger nut onto each rod. Continue alternating planks and nuts. Secure the slats with a nut threaded onto the end of each rod. Brighten up your next party with a string of festive lights. 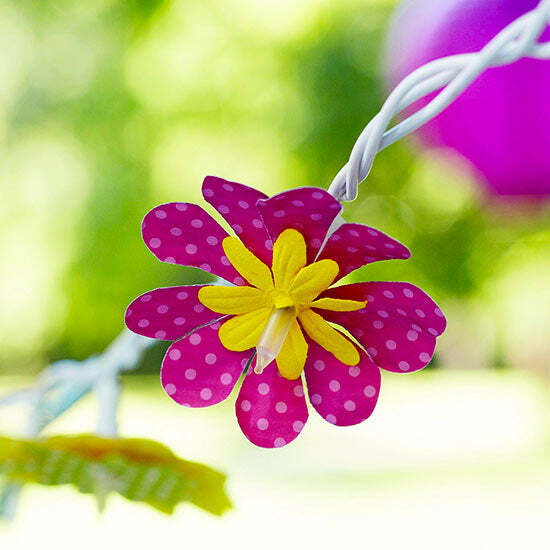 Slip precut faux flower petals onto mini outdoor lights and glue into place. Layer smaller and larger flowers together for a bigger impact. Give a plain roller shade ($15) color and punch with a painted pattern. Using a ruler and T-square, mask off straight stripes with blue painter's tape. Apply latex paints in your desired colors using a foam roller. Let paint set, peel off the tape, then let the paint dry completely. DIY Tip: Keep paint from bleeding into your stripes by sealing the tape tightly to the roller shade: Run over it with a straight edge, and roll the paint roller away from the tape, not toward it. 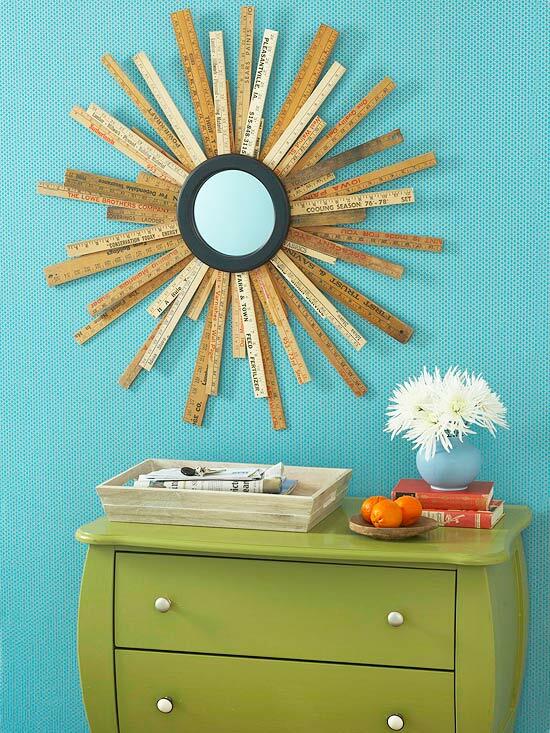 Create your own trendy starburst mirror using yardsticks cut to staggered lengths. Purchase a round mirror, and look for secondhand wooden yardsticks at flea markets or antiques stores. You also can purchase new ones at home centers for less than a dollar each. Cut them into lengths using a handsaw. Trace around the mirror on newspaper; arrange medium-length pieces around the perimeter of the template, overlapping it by 2 inches. Spread wood glue on the tips, lay the mirror, right side up, on top, and weigh it down with a stack of heavy books. When dry, turn the mirror over and layer on shorter and longer lengths, working a few at a time and weighing them down until dry. Give a mod twist to a wrought-iron chandelier with a string of wooden balls. Select several different-size balls from the woodworking aisle at the crafts store. Screw small metal eye hooks into opposite ends of each ball. Link the eye hooks to chain the balls together, then drape from the chandelier. DIY Tip: Use a pair of needle-nose pliers to grasp and twist the tiny eye hooks. Highlight a fun collection using a bold swath of color on the wall. Mask off a rectangle that is substantially larger than your wall shelf, then fill in the outline with latex paint (a quart will work great). When dry, rehang the shelf and arrange the collection against its dramatic new backdrop. Put your touch on off-the-shelf furniture by transferring any favorite image -- a photograph, a bit of a painting, or even a fabric pattern -- to the plain surface. Scan the image into the computer and print it on transfer paper, which you can buy online and from office supply and crafts stores (about $20 for a package of ten 8x10-inch sheets). Follow the package instructions to transfer the image. 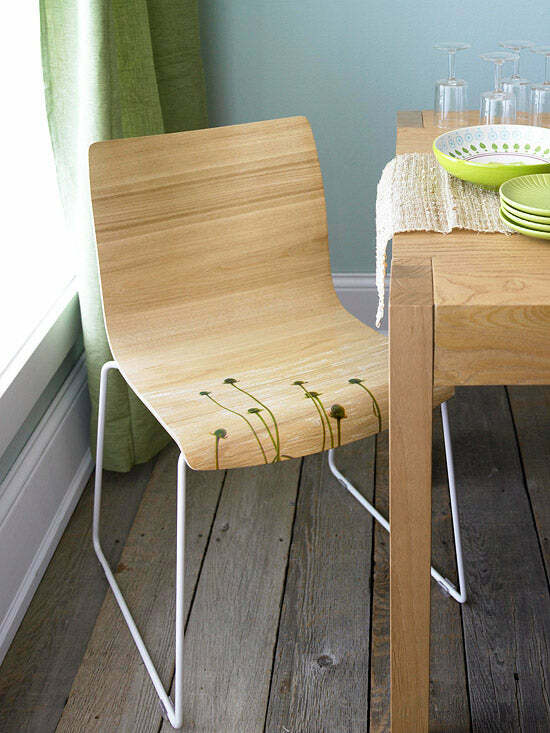 These bentwood chairs have the perfect smooth surface for such a project. DIY Tip: Be sure to purchase the right kind of transfer paper for your particular ink-jet or laser printer. DIY Tip: Depending on the size of your shelf, you might be able to purchase a tester-size can of paint, which typically costs $3-$6 for about 5 ounces. That's enough paint to cover about 10 square feet. For virtually no cost at all, you can mold an attractive centerpiece. Employ the simple technique of papier-mache, which involves dipping strips of paper into a solution of equal parts white glue and water. Turn over a mixing bowl and cover it with plastic wrap. Tear strips of paper: book pages, magazines, sheet music, wrapping paper, or wallpaper will work, but here, the artistic look comes from copies of blueprints placed facedown with a layer of patterned scrapbook paper laid right side up. 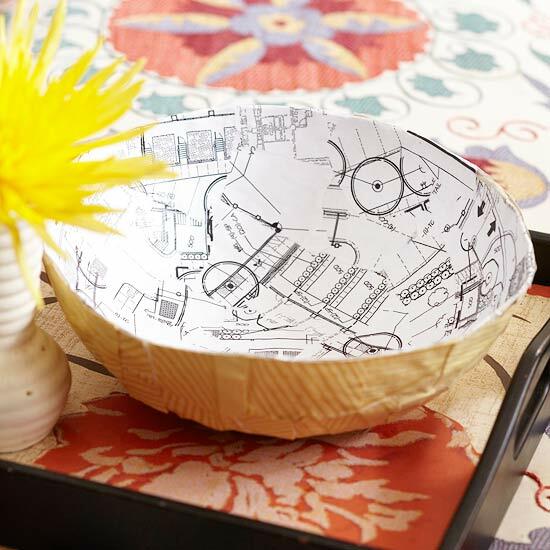 Apply at least three layers of paper to develop a sturdy vessel; let dry. Remove plastic wrap and bowl, and, if necessary, smooth any rough edges with fine-grit sandpaper. 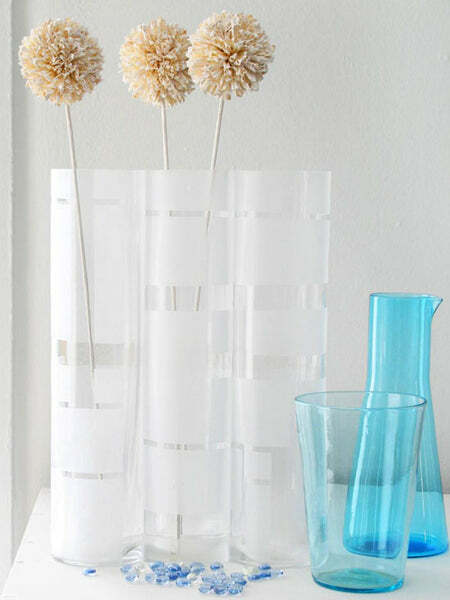 Boost the sophistication of a set of clear glass vases by adding subtle stripes. To get the etched look without messing with caustic etching cream, mask off stripes of different widths using painter's tape, then spray with paint that mimics the look of frosted glass. DIY Tip: The more coats of frosted-glass paint you apply, the more opaque and noticeable the stripes. We applied two coats to our vases. 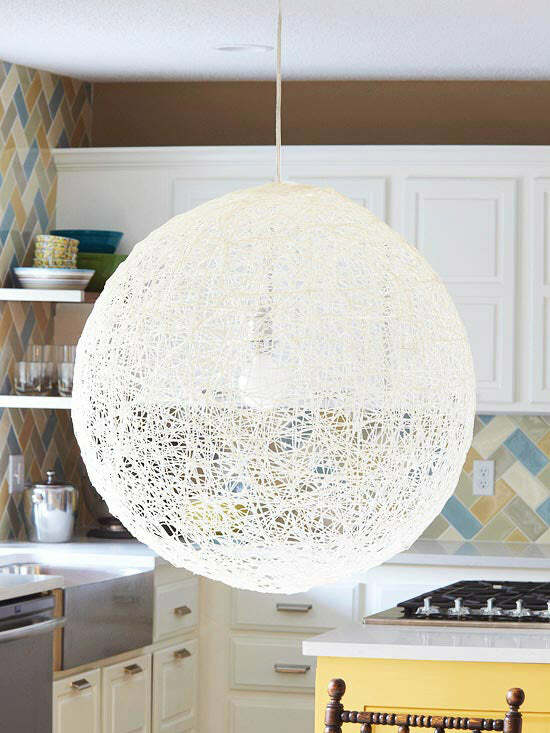 Create a chic, midcentury pendant fixture using just string and a balloon. Purchase a 35-inch balloon from a party goods store, and blow it up to about 30 inches. Brush it with a thick coat of fabric stiffener, which you can find at fabrics and crafts stores. Wrap the balloon with white crochet string, brushing on more stiffener as you work to ensure a thick coating. Let dry for 24 hours, then pop the balloon. DIY Steps: Illuminate the shade using an inexpensive light kit for hanging lanterns. First, tie a knot in the cord about 7 inches from the bulb. Thread the plug end through a slit in the center of a plastic butter-tub lid. Using kitchen shears, cut a hole in the top of the globe slightly smaller in diameter than the butter-tub lid. Insert the bulb and lid in the globe. Hang the cord from a hook in the ceiling. 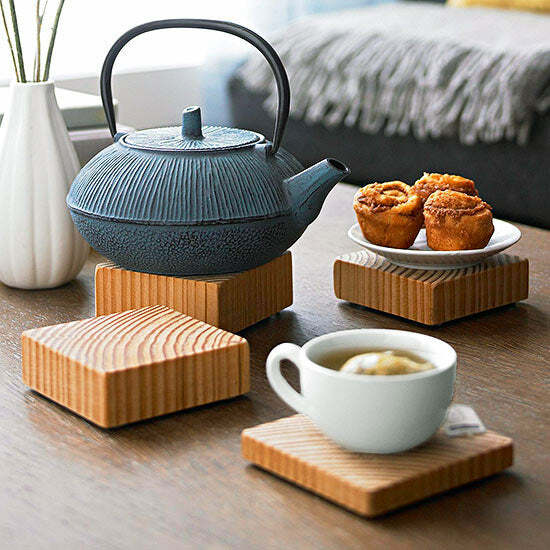 Raid the scrap bins at the local lumberyard or home center to salvage free material for these handy coasters. Cut one 4x4 wood board down to different segments using a handsaw and a miter block to ensure straight cuts. Sand the edges and corners smooth, and apply a coat of natural wood stain and sealer (starting at $15 for a quart) to show off the grain. DIY Tip: Stick felt pads or cabinet bumpers in each corner on the bottom. Choose from more than 400 house plan designs that we offer in a wide range of styles and sizes. Some of our more popular house designs include European-inspired Georgian and palladian homes, English manor house plans, Tuscan-style Italian villas, French chateaux, and colonial house plans. Our Tuscan-style villas range from 1800 to 14,814 sf, and Newport classic house designs range from 1500 to 5000 sf. Our starter castles, mansions and estate homes are designed in the grand traditon of some of the most impressive homes in the world. Please feel free to search our house designs offered. Our plans have been built around the globe, from Canada to Dubai, and one could be just for you! 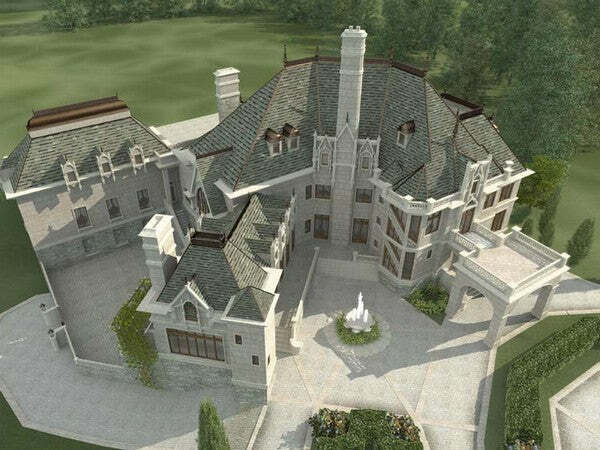 Luxury Home Plan above is Archival Designs' Luxury Starter Castle, Chateau Novella.